Lou Doillon is present on this blog for the third time. Her first solo album 'Places' was reviewed by Erwin Zijleman. At the time I could only agree with his points of view and still do. 'Lay Low', her second reviewed album I took care of my self. 'Soliloquy' is mine all the way as well. On her new album Lou Doillon blends past and present even more than before. The album has on the one hand something totally unique, totally of itself. On the other there are these little references to things long past. Take 'The Joke', the second song on the album. The main sounds are very modern. Dark, brooding sounds, without exactly being beats, in the centre create a modern atmosphere. On the fringes there's something straight out of 60s movies. Doillon mixes these atmosphere to perfection in 'The Joke'. It proves to be a selling point for Soliloquy. Her new album is more electronic than 'Lay Low'. Electronics, smooth, soft beats and atmospherics are the bedding from which Soliloquy is fleshed out. It is in the strong accents the album starts to come alive. There are simply so many details that I can not rule out to still be discovering some new ones a year from now. A sound I simply never recognised or never focused enough on. Even in the fairly straight forward 'Too Much' so many little things are happening. The song is an instant favourite I notice. The driving beat propels the song forward, even when the rhythm is mainly provided by Lou Doillon's voice, it goes ever forward. Yes, I already love this song. Even after only a few listening sessions it is already a favourite. 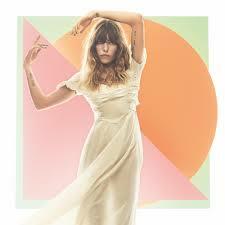 Another part of the attraction of Soliloquy and her other records is Lou Doillon's voice. It has a rough edge, like a light version of Marianne Faithfull, so unbroken. She gives all the songs a roughness, even when the music does not. There's a hint of danger in this voice, an edge I would not like to encounter at the wrong moment. As I only have to listen to the songs, the attraction is irresistible and extremely rewarding. Soliloquy is a very diverse, rich album. More so than it's predecessor, that by the way made it easily to my favourites of 2015 (and is among the best read posts on this blog). 'Too Much' e.g. is followed by 'It's You', a totally stripped song. An acoustic guitar, several vocals by Lou Doillon herself, showing off her different voices. The rest is just atmosphere and another winner is scored. So different, the same result. The album has a total of four producers. This may well explain the very different approaches to several songs. The consistency of quality can only be attributed to Lou Doillon's songwriting skills. It makes Soliloquy a far more diverse album than 'Lay Low' that she made with Timber Timbre's Taylor Kirk, who is one of the four producers here. Soliloquy is the far more modern album with a extremely well-functioning rearview mirror. Even the typical rolling piano sound of the 'The Persuaders' soundtrack comes by. Soliloquy is extremely rich in sound(s) and genres. This makes that each song comes as a true surprise playing the album the first few times. These changes are something the listener has to stomach. Well, I have and I can only say that my impression this early into February is that the first true masterpiece of 2019 has revealed itself to me. Lou Doillon really reigns. After the certainly nice 2017 album 'Rest' by her half sister Charlotte Gainsbourg, Lou Doillon takes back the crown in the Birkin dynasty.